The scientific name for the black pepper plant is Piper nigrum and it belongs to the Piperaceae. Black pepper grows in hot and humid areas. It is not surprisingly native to South India and grows well in other tropical regions. Because the plant prefers to grow under shade, plantations are often interspersed with coffee and tea plants. It is the fruit of this flowering vine that is called peppercorn and that has culinary and medicinal uses. Black pepper is what you obtain after cooking for a little while and drying the almost ripe fruit, green pepper is the dried unripe fruit and white pepper is the dried seed of the berry. 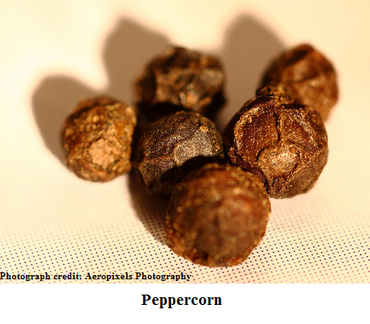 Black pepper is the most potent in terms of flavour and derives its pungency from piperine. Black pepper is immensely beneficial in alleviating digestive problems as it is a carminative, that is, it prevents intestinal gas formation. This is largely due to its ability to stimulate the production of hydrochloric acid. Piperine in black pepper is said to make the body more receptive to a number of nutrients, in particular curcumin, which is supposed to help fight cancer. The phytonutrients in the outer layer of black pepper eliminate fat cells and thus aid weight reduction. It loosens up phlegm and is therefore a useful remedy for a congestive cold, asthma and whooping cough. Black pepper has antioxidants that fight free radicals which are known to age the body and cause cancer. As a diuretic (promotes urination) and a diaphoretic (promotes sweating), black pepper is a good toxin cleanser for the body. It is known to be able to remove cholesterol, which can accumulate on arterial walls, and reduce the prospect of arteriosclerosis. A little pepper in a balanced diet could protect you from a heart attack or a stroke. Studies show that piperine in black pepper can help in lessening memory impairment and cognitive problems and could possibly be part of a treatment for Alzheimer’s disease and other forms of dementia. Piperine also acts as an antidepressant. Black pepper can prevent tooth decay and provide relief from toothaches. Caution: Do not consume black pepper in vast quantities. Some people may have an allergic reaction to it. Avoid pepper if you have undergone an abdominal surgery as it can irritate the intestinal lining. Ingredients: ¼ kg prawns, 100 gm of semolina or breadcrumbs, 1 tbsp of turmeric powder, 1 tsp of chilli or pepper powder, 6 tbsp of edible oil and salt. Preparation: Clean the prawns and apply salt to them. Prepare a mixture of semolina/breadcrumbs, salt, turmeric powder, chilli/pepper powder. Roll the prawns in the mixture and fry in oil. Ingredients: ¼ kg shellfish, 2 onions, 3 tbsp grated coconut, ½ tsp turmeric, ¼ tsp coriander powder, 1 boiled and chopped potato, ¼ tsp tamarind powder and salt. Preparation: Clean the shellfish well, removing all traces of mud or dirt. Chop two onions finely and fry them in a frying pan with oil. Add the shellfish, grated coconut, turmeric powder, coriander powder and salt. Add the boiled and chopped potato, tamarind powder and a little water, and cook it for 15 minutes. Fenugreek poultice: For skin inflammations such as abscesses, eczema, boils and burns apply a fenugreek poultice. Grind a spoonful of fenugreek seeds and mix the powder in warm water. Soak a piece of clean cloth in the mixture and apply this cloth on the affected area as a poultice.